Surprising, creamy, refreshing... This is the tomato stuffed with tuna belly mousse recipe sent by Noelia, perfect to treat and delight your guests! And for further ideas to complete the menu, check out her blog Delantales y fogones or her Instagram account @delantalesyfogones. Besides, if you live in Madrid, you are in luck, as she offers a catering and home Chef service. In the bottom part, (the one in contact with the plate), make a small X-shaped cut that will help peel it later. Dip the tomato in boiling water for 30 seconds, then quickly in ice water for another minute. Take it out, peel it and slowly empty it with a spoon, taking out small balls and making a hole without breaking it (since it is already peeled, it is more delicate). Save these balls for later. Once the tomato is empty, set aside (leaving the entire skin, without breaking it). Mix together 40 g of White Tuna belly, a hard-boiled egg, a tablespoon of ketchup, two tablespoons of mayonnaise and Perrins salsa to taste. Mash the mixture, introduce it into a piping bag and fill the tomato. Mix together the tomato leftovers, two basil leaves and a slice of bread to prepare the basil salmorejo. Mash the mixture and add salt and olive oil to taste. 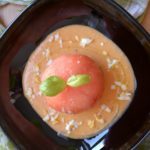 Spread the salmorejo as a base on a plate and place the tomato on top, the part used for the filling facing down. Once the tomato is placed, add Maldon salt and a drizzle of olive oil. For the presentation, make a small incision on the top and add a fresh basil leaf to enhance the color and aroma. Simply spectacular! Thank you, Noelia!